Delete, move, or mark multiple messages. While viewing a list of messages, tap Edit. Select some messages, then choose an action. If you make a mistake, shake iPhone immediately to undo. Organize your mail with mailboxes. Tap Edit in the mailboxes list to create a new one, or to rename or delete one. (Some built-in mailboxes can’t be changed.) 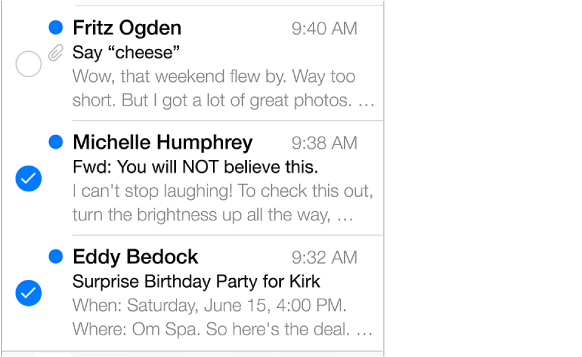 There are several smart mailboxes, such as Unread, that show messages from all your accounts. Tap the ones you want to use. Recover a deleted message. Go to the account’s Trash mailbox, open the message, then tap and move the message. Or, if you just deleted it, shake iPhone to undo. To see deleted messages across all your accounts, add the Trash mailbox. To add it, tap Edit in the mailboxes list and select it from the list. Archive instead of delete. Instead of deleting messages, you can archive them so they’re still around if you need them. Turn Archive Mailbox in Settings > Mail, Contacts, Calendars > account name > Account > Advanced. To delete a message instead of archiving it, touch and hold , then tap Delete. Deal with a message without opening it. Swipe left on a message, then tap Trash or Archive. Or tap More to move, forward, reply, flag, mark as read, or move it to the Junk folder. Stash your trash. You can set how long deleted messages stay in the Trash mailbox. Go to Settings > Mail, Contacts, Calendars > account name > Account > Advanced.